Events to check out this weekend, February 7 to 10. The Tibet House Benefit Concert is in its 32nd year but each stellar lineup happens once in a lifetime. Tonight’s installment features Debbie Harry, Stephen Colbert, Jon Batiste, Angélique Kidjo, Laurie Anderson, and the inimitable Patti Smith, with artistic director Philip Glass, and co-founder of the NYC Tibet House Bob Thurman: religious scholar, friend to the Dalai Lama, and Uma Thurman’s dad. 2. Celebrate Black History Month. All month the Museum of the Moving Image hosts a film series in honor of Black History Month, with a screening every Friday. This week, catch a conversation with Karyn Parsons, a filmmaker who you may also know as Hilary from The Fresh Prince of Bel-Air. Parsons’s company Sweet Blackberry produces animated stories for children based on lesser-known black heroes, and along with her talk she’ll screen The Bessie Coleman Story, about the the first African-American female aviator. On Sunday at Caveat it’s the Blackademia Takeover, an interdisciplinary, research-inspired stand-up comedy show where academics get on stage to drop knowledge about topics like life as a black astrophysicist, microaggressive health care, woke laws, and much more. But, you know, with jokes. 3. Soothe yourself with music. Sharon Van Etten’s first LP in over four years, Remind Me Tomorrow, is as expansive as her life now — while writing it she also completed a psychology degree, had a baby, scored TV shows and film, and guest-starred on a Netflix show. Special guest Fred Armisen joins her in eschewing her former guitar-driven minimalism for a new pop style on Saturday at the Beacon Theater. And on Sunday (and Monday), globe-roaming folk-popper Zach Condon is at Brooklyn Steel in support of the new Beirut album, Gallipoli. Get ready for some jingly-jangly hooks. 4. See some true performers. You need Monet X Change in your life. You can find the Drag Race star at the intimate Laurie Beechman Theatre (former haunt of Joan Rivers) this Thursday through Saturday with her show Call Me by Monet. There’ll be singing and crawling on the bar and stealing of your food, but you’ll like it. And just in time for fashion week, designer and raconteur Isaac Mizrahi is at the Café Carlyle through the 16th, weaving yarns and covering songs by Cat Stevens, James Taylor, and more. And just like at a fashion show, there’s swag, gifted by him from the stage. 5. Define your own adulthood. Hey, there’s no one way to be an adult. Wanna roll around in confetti and have a professional photographer shoot it? You got it. Really — this Saturday and Sunday, at the Confetti Project’s Open Studios series, just pick a time slot for a five to ten-minute confetti photo shoot, and edited photos will be mailed to you. Then show them to your friends as evidence that for at least one moment, you felt joy. Then, on Sunday at Union Hall, there are two installments of #ADULTING with hosts Michelle Buteau and Jordan Carlos, each with a fire lineup. At 5 p.m., catch Marie Faustin, Nore Davis, and Chris Redd, and at 7 p.m. it’s Wyatt Cenac, Alex English, and Phoebe Robinson. 6. Explore history through performance. Through Sunday, the Irish Arts Center presents singer-songwriter Declan O’Rourke’s song cycle Chronicles of the Great Irish Famine, which won a 2018 RTÉ Radio One Folk Award, by combining true and fictional stories of history and O’Rourke’s life. And this weekend the documentary The Gospel of Eureka opens, about the LGBTQIA-friendly town of Eureka Springs, Arkansas, which is also home to a live-action Great Passion Play. Both the Friday and Saturday screenings at 7:15 p.m. are followed by Q&As with directors Michael Palmieri and Donal Mosher and narrator and Tony winner Justin Vivian Bond. 7. Delve into the Lunar New Year. Happy Year of the Pig! Learn about the rich history of the lion dance tonight at the Museum of Chinese in America, then don your red for the weekend. At Brookfield Place on Saturday, in partnership with the New York Chinese Cultural Center, they’re celebrating with traditional dances, a martial arts demonstration, and theatrical players. From noon to 4 p.m., the Queens Botanical Garden has themed crafts, performances, workshops, a zodiac-themed story-time, and more, and on Saturday and Sunday you’ll find parades in the Chinatowns of Flushing and Sunset Park, respectively. 8. Make some furry friends. This Saturday, there will be puppies. Breeds from Akitas to Xoloitzcuintlis, some that can jump, some that run, others that can strut, and all of which are very good boys and girls. Find them at Westminster Week, with the AKC Meet the Breeds and the Masters Agility Championship and Finals this Saturday at Piers 92 and 94. 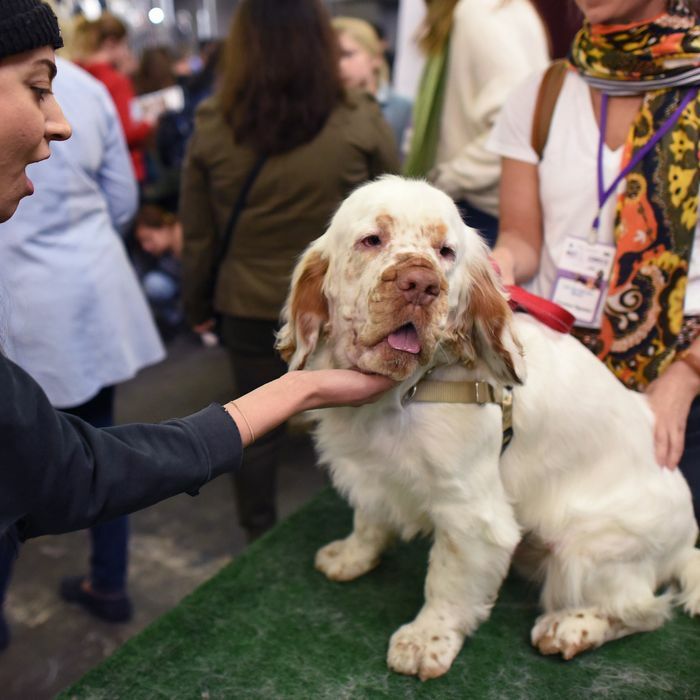 The dog show itself takes place Monday and Tuesday both at Piers 92 and 94 and at Madison Square Garden. 9. Get prepped for Valentine’s Day. Did you know Bon Jovi makes wine now? And they’re doing a special promotion for Valentine’s Day. If your significant other loves a hair band from New Jersey, or just enjoys a good but somewhat unfortunately-named rosé, consider picking up a Bed of Roses gift box, which pairs JBJ’s Hampton Water rosé with a bouquet from Winston Flowers. If you’re trying to get with a metalhead, Metallica has collaborated with Stone Brewing for the hoppy pilsner Enter Night, now available. (Have a few of those and go off to never-never land.) But if your goal is to help out your best buds, on Sunday, take them to Littlefield for Friends of Single People, where lonely hearts have a champion in Jo Firestone, host of the comedy-dating show hybrid where comedians chat with contestants for ten minutes, then answer questions on their behalf. Sometimes, there’s a match. Either way there’s laughs. 10. Sing along to the Grammys. The Grammy Awards are on Sunday, and if you’d rather not watch performances by St. Vincent, Travis Scott, Ricky Martin, Kacey Musgraves, and more alone/with Twitter, SOB’s hosts a free Grammy Viewing Party, with food and drink specials all night. Just try to hide your tears when Yolanda Adams, Andra Day, and Fantasia honor Aretha Franklin.